Techmould are FFKM perfluoroelastomer and PTFE products manufacturers. 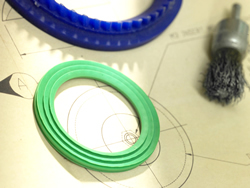 Perfluoroelastomer is a rubber version of PTFE. FFKM exhibits outstanding chemical resistance against a wide variety of chemicals such as acids, alkalines, keytones, esters, alcohols, hot water and steam. Perfluoroelastomers also have excellent physical qualities and very good compression set over a wide range of temperatures. Our vacuum chamber moulding presses enable us to produce high quality, consistant and competitive priced mouldings from this high specification and value compound.